Technology can be a powerful source for democratisation of art. In this post we invite you to explore how one collector is using technology to turn his collection into an on-line museum and resource. 88-Mocca is an online museum that exhibits Fritz Kaiser’s collection of Chinese contemporary art, including prominent works by Zhang Xiaogang, Zhang Huan, Zeng Fanzhi, and Wang Guangyi. It is not a novel concept but has the art world fully understood the lack of limits offered by an online museum. Admittedly works cannot be viewed physically which is a self-evident drawback. But against this art on-line enables viewers who would never have access to physical art works to access art. On this site for example many major works of Chinese contemporary art can all be accessed in one place. And unlike a brick-and-mortar museum, it is possible to access 88-Mocca at all times, day and night. There are no limits to the number of exhibitions and content which can be put up creating easily accessed exhibition space that can also be changed at little extra cost. With no limits to the number of visitors, viewing times, number of exhibitions it is exciting to consider what effect this will have on bringing art to a new wider audience. The power of the Internet has truly manifested itself here: aside from accessibility, users of sites such as 88 mocca are able to interact with art in ways they could not in traditional museums. You might find audioguides in traditional museums but this site offers the ability to comment on works (allowing a conversation between viewers separated by time and space) and send e-cards. Special exhibitions have been introduced: currently there is one by Yu Youhan in collaboration with ShangART gallery. There are videos that showcase specific pieces by artists and interviews with them. If you are interested in learning more about museums and how the potential of the web can be harnessed, a international conference called Museums and the Web is held annually. Then next edition will be on April 13-17 2010 in Denver Colorado but papers from this and past conferences are all available to view on-line. Subscribe to ArtRadarAsia for more information about art and the internet. Major auctions held in February 2010 in London featured impressive sales of Chinese contemporary art works reports Jing Daily with surprisingly high sell-through rates compared with works from other markets. The rising presence of Chinese collectors and bidders underpins the phenomenal performance in sales and the momentum is expected to continue claims the newspaper. Ian McGinlay, Head of Client Development for Asia at Sotheby’s, expects mainland Chinese collectors to become increasingly ubiquitous — and forceful — at auctions of contemporary art, with these buyers going for works by “blue-chip” Chinese artists like Cai Guo-Qiang, Zhang Xiaogang, Zeng Fanzhi and others. As Jing Daily reports, the overall sell-through rate of the four auctions held by the three auction houses Christie’s, Sotheby’s and Phillips de Pury — 90.5% (19/21) — was well above the overall performance of the entire aggregated sales. At Sotheby’s, 100% of Chinese works (9/9) sold; at Christie’s, 82% (7/9); at Phillips, 100% sold (3/3). For more of the original coverage, Jing Daily has more. A painting by Chinese contemporary artist Zhang Xiaogang offered by Hollywood director Oliver Stone fetched HK$26.4 million ($3.4 million) at a Hong Kong art sale where half the lots were unsold, reflecting the prevailing gloom. Zhang’s “Bloodline: Big Family, No. 2,” from 1995, was the most-expensive lot sold at Christie’s International’s evening sale yesterday. There was less enthusiasm for most other lots: buyers shunned 44 percent of Asian contemporary works and more than half of 20th-century Chinese paintings for a sale that tallied HK$140.6 million. Hong Kong’s art market remains in the throes of a slump it heralded in October when Sotheby’s auction in the city missed its target by half. Subsequent major auctions in New York, London and Dubai fell short of estimates, spelling an art-world rout sparked by the Sept. 15 bankruptcy of Lehman Brothers Holdings Inc. and the ensuing global credit and stock-market crisis. Zhang’s 1.8 meter-by-2.3 meter work shows a pursed-lipped couple with a tuft-haired toddler painted yellow. It went to an anonymous buyer after a 2-minute tussle between phone and salesroom bidders. Last night’s sale was the most-glamorous part of Christie’s five-day Hong Kong auction (Nov. 29-Dec. 3) of 2,500 antiques, gems and art that the company expects to raise HK$1.75 billion. At least 500 people, some decked in their evening best of chiffon, silks and gems, packed the standing-room-only auction- hall at the Exhibition Center which overlooks the harbor. “Hommage a Tou-Fou,” a painting by China-born, Paris-based Zao Wou-ki sold for an artist record of HK$45.5 million. Chinese artist Sanyu’s “Potted Chrysanthemums” fetched HK$8.4 million, against the presale top forecast of HK$5 million. Last evening’s biggest upset was a 1993 painting of Mao Zedong by China’s most-expensive contemporary artist Zeng Fanzhi, which failed to sell against a presale estimate of HK$30 million. 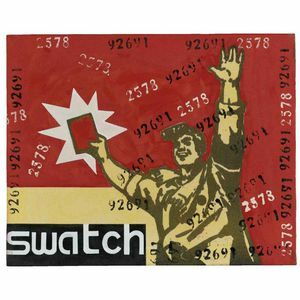 Bidding on Zeng’s oil-on-canvas “Mao I: From the Masses, to the Masses” was labored, even with auctioneer Andrea Fiuczynskic’s effort at coaxing more bids. The last offer of HK$28 million wasn’t good enough for Fiuczynskic, who rapped the gavel and called in the lot. “Mao I,” is the twin of a like-sized painting “Chairman Mao II,” also dated 1993, that fetched 2.17 million pounds ($3.3 million) at Phillips de Pury & Co.’s London auction on June 29. Oliver Stone had consigned five Chinese contemporary paintings at this sale, three of which featured at last night’s event. 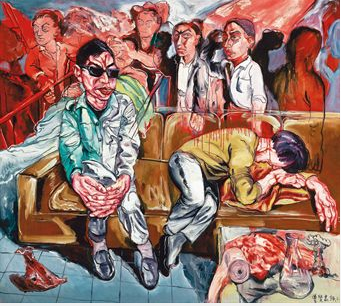 The other two, both Liu Weis, sold for a combined HK$7.5 million, near the low end of estimates. Two last paintings will be offered at Christie’s day sale this afternoon. Demand for Southeast Asian art, whose prices defied the demand weakness at Sotheby’s October auction, eased at this sale. A mixed-media painting by the region’s most-expensive painter I Nyoman Masriadi fetched HK$2.1 million, against the work’s top estimate of HK$1.6 million. The priciest lot sold at the Southeast Asian auction was Filipina Juan Luna’s “Roman Maidens,” which fetched HK$4.7 million, against the painting’s low estimate of HK$8 million. Except for wines, Christie’s charges buyers 25 percent on the first HK$400,000 of the hammer price, 20 percent of the amount above that, up to and including HK$8 million, and 12 percent of subsequent sums. In a move which supports the growing status of Hong Kong as Asia’s art market hub, Taiwanese auction house Ravenel Art announces its first Hong Kong auction of Contemporary and Modern Asian Art on Monday December 1, 2008. 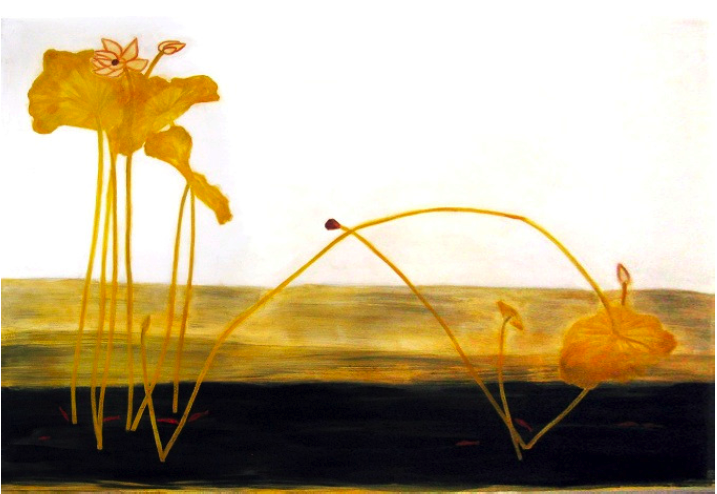 In Modern Chinese Art works by Sanyu, Zao Wou-ki and Chu Teh-chun will be offered. In the Chinese Contemporary section important works by Zhang Xiaogang, Zeng Fanzhi, Wang Guangyi, Yue Minjun and Yan Pei Ming will come under the hammer. Ravenel Art will also include works by Korean, Japanese, S. E. Asian and Indian artists. Kim Tschang-yeul and Park Seo-Bo, two of the most important Korean artists will be represented. Paintings by Japanese artists Hino Korehiko and Hiroyuki Matsuura are sure to attract much attention. The S. E. Asian section will include works by Agus Suwage and Budi Kustarto, two of the most sought after artists at the moment. A work by Justin Ponmany, one of the leading Indian contemporary artists will also be on offer. The auction will be held in the Four Seasons Hotel Ballroom, 8 Finance Street, Central, Hong Kong on Monday December 1. Ravenel Art was founded in 1999 and it holds two annual Spring and Autumn auctions in Taipei and will hold Spring and Autumn auctions in Hong Kong. It specializes in Modern and Contemporary Chinese Art, Korean, Japanese, S. E. Asian and Indian Contemporary Art. The company has offices in Taipei, Hong Kong and Beijing. While much of Hong Kong hunkered down just hours before the arrival of a typhoon on Oct. 4, the start of Sotheby’s three-day auction of modern and contemporary Asian art was buffeted by the financial storm on Wall Street. Of the 47 works that went under the hammer, more than 40% were unsold. What’s more, earnings for Sotheby’s (BID), including the auctioneer’s commission known as the “buyer’s premium,” were a paltry $15 million, accounting for just 41% of the auction house’s estimated takings for the night. Among the biggest upsets was the unsold work by India’s hot-selling artist Subodh Gupta, Untitled, which had an estimated price of $1.55 million to $2.05 million. Another big surprise: Chinese cynical realist painter Liu Wei’s triptych, The Revolutionary Family Series, failed to find a bidder willing to meet the $1.55 million suggested minimum. Yawns gave way to disbelief a little later when two works by white-hot Chinese artist Zhang Xiaogang went unsold. That’s a huge reversal for the Beijing-based artist, whose paintings have routinely fetched millions of dollars, well in excess of auction estimates. (His painting Bloodline: Big Family No. 1 was one of the few top lots that sold on Saturday, though the $2.97 million price was below the expected maximum.) Yue Minjun and Zeng Fanzhi, two others among the hottest-selling Chinese contemporary artists, did manage to sell, although well within the estimates. You connect the dots: Wall Street goes into meltdown, and Sotheby’s auction bombs in Hong Kong. Kevin Ching, Sotheby’s CEO for Asia, tries to be optimistic about whether the two are connected. “I hope there is no immediate direct correlation between the financial market and the art market,” he says, pointing to the widely successful auction of enfant terrible Damien Hirst’s works in London within days of the collapse of Lehman Brothers. The problem with some of the Hong Kong auction, he adds, stems from overly ambitious owners trying for unreasonably high prices. “When we have [sellers] who want aggressive estimates over and above what [the] market can accept, they would have to occasionally accept the consequences, and I think that’s what happened here [Saturday] night,” Ching explains. Still, others in Asia’s art business are certain the fallout from Wall Street is already hurting Chinese and Indian markets. In both countries, newly wealthy investment bankers and hedge fund managers helped inflate bubbles in works by local artists. For instance, in the last four years a booming Indian economy and buoyant stock market encouraged many private banks to offer fee-based services to assist clients in building portfolios of artworks sourced from galleries, auctions, and even direct sales. Fund managers say that investment bankers with their hefty bonuses helped inflate art prices by 30% to 60% above their real value, according to a gallery owner in Mumbai. Now with Wall Street in turmoil, most of the bankers who were regulars at art shows and auctions have moved out, says avid art collector Harsh Goenka, chairman of India’s diversified RPG Enterprises, which has interests in tires, power, and retail. He claims that in the last few years, around 60% to 70% of art sold in auctions and shows in India went to the new breed of investor rather than art connoisseurs. “They looked at art as a brand and made money by trading in it,” says Goenka. In the past few months, he says, painters and art dealers have been calling him up to offer their unsold works at a 30% to 40% discount. The picture isn’t all grim, though. The mood was positively ebullient at Sotheby’s Hong Kong on Oct. 6 as buyers crammed the room for the auction of Southeast Asian contemporary paintings. Sotheby’s employees manned the phones to handle enthusiastic overseas bidding. For instance, Indonesian painter I Nyoman Masriadi had already set a personal record on the first day of the Sotheby’s auction when his huge canvas featuring Batman and Superman sitting on adjacent toilets sold for $620,000. He then surpassed that with a painting of boxers that seems part Botero, part Léger; it fetched a high $833,000. A bit later, during furious bidding for yet another Masriadi, the auctioneer exclaimed “This is really, really fun.” The room broke into applause when the work finally sold for a very respectable $307,000. The reason for this sea change in sentiment? The prices were far more affordable than the works from China and India on sale during the weekend, and collectors seem to have finally cottoned onto the notion that Indonesian, Vietnamese, and Filipino artists represent opportunities for collectors to own great art. One work by up-and-coming Filipino painter Geraldine Javier sold for $32,000, more than three times the high estimate. An intimate portrait of a woman and child by Vietnamese painter Mai Trung Thu also sold for triple the estimate, fetching $23,000.